When you are looking for a portable writing surface or a place for kids to do art, Hertz Furniture has great easels for you to choose from. 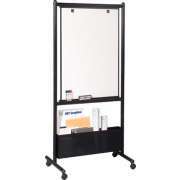 We have professional display easels as well as whiteboard easels and teaching easels. With so many options to choose from, you are sure to find great choices for your office or school. Can you get an erasable easel? 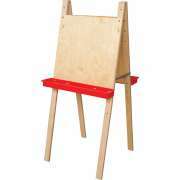 Easels are available with a selection of surface materials. Depending on your preference, you can choose between whiteboard, feltboard and chalkboard. 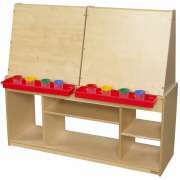 Convenient features such as marker trays, storage bins and big book holders make many of our easels perfect for an early-childhood setting. Where can you use a whiteboard easel? Having a large writing surface where notes and examples can be displayed is helpful in both educational and professional environments. While a wall-mounted dry erase board might not be a practical thing to have in the office, sometimes executives can benefit greatly from having a whiteboard easel. Even when there are only two or three people in a small personal meeting, having a large space that can be viewed by all makes it easier for everyone to communicate, especially when complex concepts are being discussed. 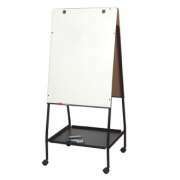 A portable whiteboard will make a convenient addition to any learning environment. Whether students are just learning their letters or refining their knowledge of college-level physics as part of the STEM Education curriculum, having a space to work out problems and display examples will help them learn faster and better. White boards can be used with markers of almost any color, which makes it easy to present information in an organized manner. What kinds of portable chalkboards are there? 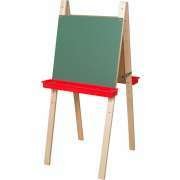 For those who prefer the more classic school furniture, we also have great chalkboard easels. These portable blackboards can be used almost anywhere. They can easily be folded up and carried away or rolled into position. 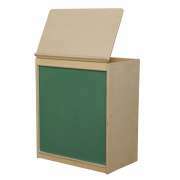 This design is ideal for a setting in which some extra writing space is needed on an occasional basis in various venues. Many people have strong opinions about what kinds of surfaces they like to write on. If you want to ensure that every teacher and employee can work under the optimal circumstances, you need to provide options. 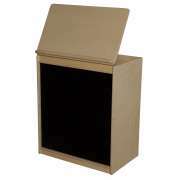 Best Rite offers a convenient solution for varying preferences. 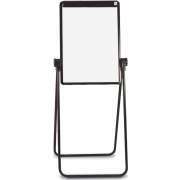 Now you can have a teaching easel which offers multiple writing surfaces. With a chalkboard on one side and a dry erase board on the other, instructors can have their preferences, no matter what they are. What can I do with a felt board? As little ones develop writing, shape recognition and color identification skills, it is important to facilitate hands-on learning opportunities. The more active little ones are in the educational process, the more likely they are to enjoy learning and internalize lessons. 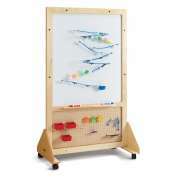 A feltboard easel offers a great way to get students involved in board work, even before they are capable of writing. In a preschool or kindergarten classroom, children will just love helping to place the cutouts on the surface for all to see. They won&apos;t even realize the great strides they are making in early literacy development, while they are having lots of fun. 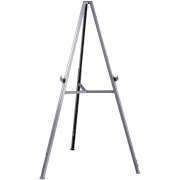 What are the benefits of a teaching easel? 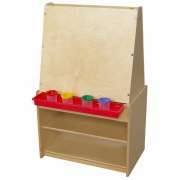 In an early-childhood setting, a teaching easel is a must-have. When a teacher wants to write something in large print during circle time, she can keep the portable whiteboard right next to her so she won&apos;t have to keep on getting up. 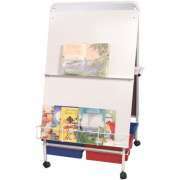 Many of our teacher easels include convenient big book holders so they are helpful during story time as well. Rather than trying to hold the book in one hand while turning the page with the other and reading upside down so little ones can see the pictures, teachers can simply prop the books up against the board where they are easy to see and read from a comfortable position. 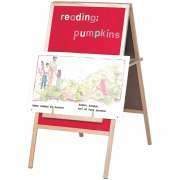 When you want to place a menu, sign or chart in a visible position, a display easel from Ghent can really come in handy. This useful tool is helpful when you need to direct people at conferences or seminars, publicize cafeteria menus or show off student work. 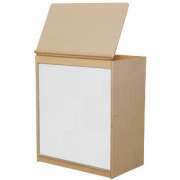 It folds up compactly so it can easily be stored just about anywhere. While all of our presentation easels are portable, there are varying design features which might be more suited to certain needs. Many of our models are foldable, which is perfect if you only need a temporary writing surface, or you constantly need to move it from place to place. If you plan on relocating your easel often, rather than moving it in and out of storage on occasion, a mobile model on wheels might be preferable. To get your board set in the perfect position every time, we have teaching easels which accommodate angle and height adjustments. 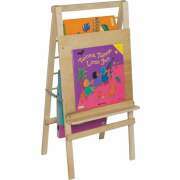 Where can I get an easel that is the right size for kids? 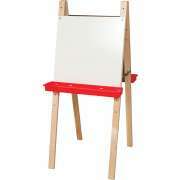 Of course we also have easels for kids, which are perfect for painting centers and art classrooms. 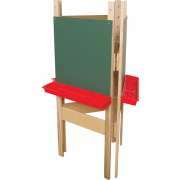 Our kids easels are designed to maximize your learning space so two children can paint at once. 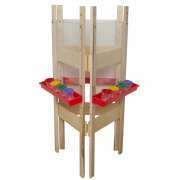 They are great for little ones who are developing their motor skills and expressing their creativity. With clips to hold the paper in place, it is much easier for children to paint and make less of a mess. At Hertz Furniture, we know that having the right equipment makes all the difference. 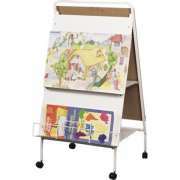 Our whiteboard easels and kids art easels are easy to use and convenient to transport. With a number of different surface materials and styles to choose from, you can find a presentation easel that is perfect for virtually any venue.